There is always the first time for everything, and this includes submitting your first comment on a blog post. Were you scared, exulted, bewildered or even a bit blasé, as if the process was totally natural to you? As one blogger said, surely commenting is like writing a post, but you just write less. And yes, it is. I suppose the better writer you are, the easier it would be to write excellent comments. Many bloggers have confessed to me they are apprehensive about commenting. Even when they have passed the first comment stage. They are worried what others will think of what they have said. This paranoia may seem unnecessary, but actually it stems from the idea that blogs are available for everyone to read. Any comment on a blog is wide open, so is subject to ridicule, objection, disapproval – a catalyst to enhance any blog reader's lack of esteem. Of course anyone can read a blog, but in reality only those who interested in that particular subject will be doing so. A blog's readership is confined to its like-minded audience, who are more likely to be sympathetic to your views and what you have to say. Therefore commenting on blogs should be seen as a safe place to express your point of view. However, what is ironic is people seem to be much happier commenting on social media. This medium is totally open to the world, and isn't even moderated! Here anyone can have their say, good, bad or ugly, and there is nothing to stop them. Social media commenting has become so main-stream, ordinary and expected, it is usually done without thinking. Many don't even consider this is a much more exposed place to express an opinion or a critique a piece of content. And this type of commenting tends to be merely a desire to create a virtual noise. It doesn't matter how you express yourself, as long as something happens: a word, emoji, like symbol, gif or whatever. Social media is a 'fun place' to comment, without any serious intent. 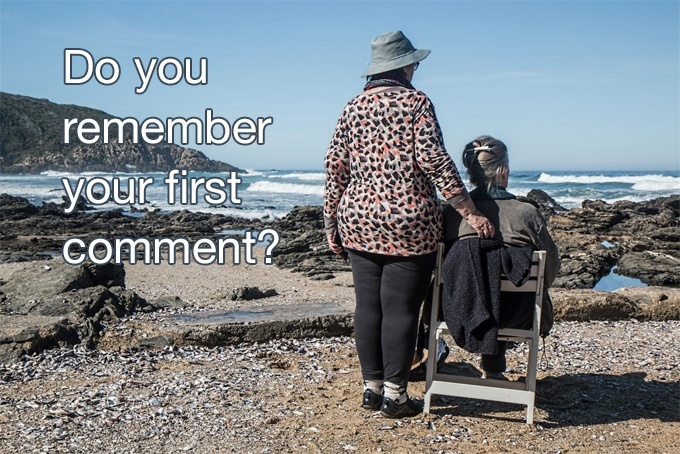 Your first comment is much more likely to happen here. However, blog commenting takes on a different slant. This isn't a trivial exercise. It's time to put on your purposeful hat if you want your first comment to count. And the style required for blog commenting may not be for everyone. It's important to remember blogs were around long before social media, back in the heady days of Web 2.0. This allowed readers to publish their response in situ immediately after reading the content. This was exciting, reactionary and revolutionary in a world of predominantly static websites. Therefore blog commenting shouldn't be merely a quick response. There is no need to make a noise just for the sake of it. Here you have the opportunity for a fuller contribution towards the host post. Now you can satisfy your commenting desire and help enhance the original content you've just read. Another apprehension is leaving a first comment on a post. That blank, empty space where the comments should be ought to be inviting. But for some readers it is daunting, and resembles a no-man's-land that shouldn't be entered into. Breaking the commenting duck is something every blogger wishes to overcome. They know that once readers start commenting, others will follow. This is something I will also be exploring within The Commenting Club, as well as instructing their readers how to successfully write a first comment to get the ball rolling. There is so much more to commenting than meets the eye. It isn't a matter of making a noise to show appreciation. It can have a real effect on both you and your website or blog, and even your business if you have one. If you aren't already a member, click on the box below. If you are, tell your friends about it! Let's resurrect the art of commenting again, and this community is here to help you do just that, together! And if you have an overwhelming desire to comment, the box is at the bottom – I'm looking forward to receiving it.